Upon Otis’s death in 1917, his son-in-law, Harry Chandler, took control as publisher of the Times. Harry Chandler was succeeded in 1944 by his son, Norman Chandler, who ran the paper during the rapid growth of post-war Los Angeles. Norman’s wife, Dorothy Buffum Chandler, became active in civic affairs and led the effort to build the Los Angeles Music Center, whose main concert hall was named the Dorothy Chandler Pavilion in her honor. Family members are buried at the Hollywood Forever Cemetery near Paramount Studios. The site also includes a memorial to the Times Building bombing victims. The fourth generation of family publishers, Otis Chandler, held that position from 1960 to 1980. Otis Chandler sought legitimacy and recognition for his family’s paper, often forgotten in the power centers of the Northeastern United States due to its geographic and cultural distance. He sought to remake the paper in the model of the nation’s most respected newspapers, notably The New York Times and The Washington Post. Believing that the newsroom was “the heartbeat of the business”, Otis Chandler increased the size and pay of the reporting staff and expanded its national and international reporting. In 1962, the paper joined with The Washington Post to form the Los Angeles Times–Washington Post News Service to syndicate articles from both papers for other news organizations. He also toned down the unyielding conservatism that had characterized the paper over the years, adopting a much more centrist editorial stance. The first generations bought or founded their local paper for profits and also social and political influence (which often brought more profits). Their children enjoyed both profits and influence, but as the families grew larger, the later generations found that only one or two branches got the power, and everyone else got a share of the money. Eventually the coupon-clipping branches realized that they could make more money investing in something other than newspapers. Under their pressure the companies went public, or split apart, or disappeared. That’s the pattern followed over more than a century by the Los Angeles Times under the Chandler family. The paper’s early history and subsequent transformation was chronicled in an unauthorized history Thinking Big (1977, ISBN 0-399-11766-0), and was one of four organizations profiled by David Halberstam in The Powers That Be (1979, ISBN 0-394-50381-3; 2000 reprint ISBN 0-252-06941-2). It has also been the whole or partial subject of nearly thirty dissertations in communications or social science in the past four decades. Another major decision at the same time was to cut the range of circulation. They cut circulation in California’s Central Valley, Nevada, Arizona and then the San Diego edition. On April 2, 2007, the Tribune Company announced its acceptance of real estate entrepreneur Sam Zell‘s offer to buy the Chicago Tribune, the Los Angeles Times, and all other company assets. Zell announced that he would sell the Chicago Cubs baseball club. He put up for sale the company’s 25 percent interest in Comcast SportsNet Chicago. Until shareholder approval was received, Los Angeles billionaires Ron Burkle and Eli Broad had the right to submit a higher bid, in which case Zell would have received a $25 million buyout fee. Baquet was the first African-American to hold this type of editorial position at a top-tier daily. During Baquet and Carroll’s time at the paper, it won 13 Pulitzer Prizes, more than any other paper but The New York Times. However, Baquet was removed from the editorship for not meeting the demands of the Tribune Group—as was publisher Jeffrey Johnson—and was replaced by James O’Shea of the Chicago Tribune. O’Shea himself left in January 2008 after a budget dispute with publisher David Hiller. The paper’s content and design style was overhauled several times in attempts to increase circulation. In 2000, a major change reorganized the news sections (related news was put closer together) and changed the “Local” section to the “California” section with more extensive coverage. Another major change in 2005 saw the Sunday “Opinion” section retitled the Sunday “Current” section, with a radical change in its presentation and featured columnists. There were regular cross-promotions with Tribune-owned television station KTLA to bring evening-news viewers into the Times fold. The paper reported on July 3, 2008, that it planned to cut 250 jobs by Labor Day and reduce the number of published pages by 15 percent. That included about 17 percent of the news staff, as part of the newly private media company’s mandate to reduce costs. “We’ve tried to get ahead of all the change that’s occurring in the business and get to an organization and size that will be sustainable,” Hiller said. Nancy Cleeland, who took O’Shea’s buyout offer, did so because of “frustration with the paper’s coverage of working people and organized labor” (the beat that earned her Pulitzer). She speculated that the paper’s revenue shortfall could be reversed by expanding coverage of economic justice topics, which she believed were increasingly relevant to Southern California; she cited the paper’s attempted hiring of a “celebrity justice reporter” as an example of the wrong approach. On January 19, 2018, employees of the news department voted 248–44 in a National Labor Relations Board election to be represented by the NewsGuild-CWA. The vote came despite aggressive opposition from the paper’s management team, reversing more than a century of anti-union sentiment at one of the biggest newspapers in the country. The Times’s reported daily circulation in October 2010 was 600,449, down from a peak of 1,225,189 daily and 1,514,096 Sunday in April 1990. In early 2006, the Times closed its San Fernando Valley printing plant, leaving press operations to the Olympic plant and to Orange County. Also in 2006, the Times announced its circulation had fallen to 851,532, down 5.4 percent from 2005. The Times’s loss of circulation was the largest of the top ten newspapers in the U.S. Despite the circulation decline, many in the media industry lauded the newspaper’s effort to decrease its reliance on “other-paid” circulation in favor of building its “individually paid” circulation base—which showed a marginal increase in a circulation audit. This distinction reflected the difference between, for example, copies distributed to hotel guests free of charge (other-paid) versus subscriptions and single-copy sales (individually paid). On July 10, 2007, Times launched a local Metromix site targeting live entertainment for young adults. A free weekly tabloid print edition of Metromix Los Angeles followed in February 2008; the publication was the newspaper’s first stand-alone print weekly. In 2009, the Times shut down Metromix and replaced it with Brand X, a blog site and free weekly tabloid targeting young, social networking readers. Brand X launched in March 2009; the Brand X tabloid ceased publication in June 2011 and the website was shut down the following month. In May 2018, the Times blocked access to its online edition from most of Europe because of the European Union’s General Data Protection Regulation. It was revealed in 1999 that a revenue-sharing arrangement was in place between the Times and Staples Center in the preparation of a 168-page magazine about the opening of the sports arena. The magazine’s editors and writers were not informed of the agreement, which breached the Chinese wall that traditionally has separated advertising from journalistic functions at American newspapers. Publisher Mark Willes also had not prevented advertisers from pressuring reporters in other sections of the newspaper to write stories favorable to their point of view. Following the Republican Party‘s defeat in the 2006 mid-term elections, an Opinion piece published on November 19, 2006, by Joshua Muravchik, a leading neoconservative and a resident scholar at the conservative American Enterprise Institute, was titled BOMB IRAN. The article shocked some readers, with its hawkish comments in support of more unilateral action by the United States, this time against Iran. On March 22, 2007, editorial page editor Andrés Martinez resigned following an alleged scandal centering on his girlfriend’s professional relationship with a Hollywood producer who had been asked to guest edit a section in the newspaper. In an open letter written upon leaving the paper, Martinez criticized the publication for allowing the Chinese Wall between the news and editorial departments to be weakened, accusing news staffers of lobbying the opinion desk. In November 2017, Walt Disney Studios blacklisted the Times from attending press screenings of its films, in retaliation for September 2017 reportage by the paper on Disney‘s political influence in the Anaheim area. The company considered the coverage to be “biased and inaccurate”. As a sign of condemnation and solidarity, a number of major publications and writers, including The New York Times, Boston Globe critic Ty Burr, Washington Post blogger Alyssa Rosenberg, and the websites The A.V. Club and Flavorwire, announced that they would boycott press screenings of future Disney films. The National Society of Film Critics, Los Angeles Film Critics Association, New York Film Critics Circle, and Boston Society of Film Critics jointly announced that Disney’s films would be ineligible for their respective year-end awards unless the decision was reversed, condemning the decision as being “antithetical to the principles of a free press and [setting] a dangerous precedent in a time of already heightened hostility towards journalists”. On November 7, 2017, Disney reversed its decision, stating that the company “had productive discussions with the newly installed leadership at the Los Angeles Times regarding our specific concerns”. The Los Angeles Times received the 1984 Pulitzer Prize for Public Service for the newspaper series “Latinos“. Times journalist David Willman won the 2001 Pulitzer Prize for Investigative Reporting; the organization cited “his pioneering expose of seven unsafe prescription drugs that had been approved by the Food and Drug Administration, and an analysis of the policy reforms that had reduced the agency’s effectiveness.” In 2004, the paper won five prizes, which is the third-most by any paper in one year (behind The New York Times in 2002 (7) and The Washington Post in 2008 (6)). In 2019, three Los Angeles Times reporters – Harriet Ryan, Matt Hamilton and Paul Pringle – have won a Pulitzer Prize for their investigation into a gynecologist accused of abusing hundreds of students at the University of Southern California. In the 19th century, the chief competition to the Times was the Los Angeles Herald, followed by the smaller Los Angeles Tribune. 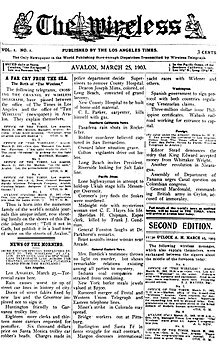 In December 1903, newspaper magnate William Randolph Hearst began publishing the Los Angeles Examiner as a direct morning competitor to the Times. In the 20th century, the Los Angeles Express was an afternoon competitor, as was Manchester Boddy‘s Los Angeles Daily News, a Democratic newspaper. For 69 years, from 1885 until 1954, the Times issued on New Year’s Day a special annual Midwinter Number or Midwinter Edition that extolled the virtues of Southern California. At first it was called the “Trade Number,” and in 1886 it featured a special press run of “extra scope and proportions”; that is, “a twenty-four-page paper, and we hope to make it the finest exponent of this [Southern California] country that ever existed.” Two years later, the edition had grown to “forty-eight handsome pages (9×15 inches), [which] stitched for convenience and better preservation,” was “equivalent to a 150-page book.” The last use of the phrase Trade Number was in 1895, when the edition had grown to thirty-six pages split among three separate sections. In 1948 the Midwinter Edition, as it was then called, had grown to “7 big picture magazines in beautiful rotogravure reproduction.” The last mention of the Midwinter Edition was in a Times advertisement on January 10, 1954. Between 1891 and 1895, the Times also issued a similar Midsummer Number, the first one with the theme “The Land and Its Fruits”. Because of its issue date in September, the edition was in 1891 called the Midsummer Harvest Number. In the 1990s, the Times published various editions catering to far-flung areas. Editions included those from the San Fernando Valley, Ventura County, Inland Empire, Orange County, San Diego County & a “National Edition” that was distributed to Washington, D.C. and the San Francisco Bay Area. The National Edition was closed in December 2004. Among the Times' staff are columnists Steve Lopez and Patt Morrison, television critic Mary McNamara and film critic Kenneth Turan. Sports columnists include Bill Plaschke, who is also a panelist on ESPN‘s Around the Horn, and Helene Elliott, the first female sportswriter to be inducted into the Hockey Hall of Fame. One of the Times' features is “Column One”, a feature that appears daily on the front page to the left-hand side. Established in September 1968, it is a place for the weird and the interesting; in the How Far Can a Piano Fly? (a compilation of Column One stories) introduction, Patt Morrison writes that the column’s purpose is to elicit a “Gee, that’s interesting, I didn’t know that” type of reaction. The Times also embarked on a number of investigative journalism pieces. A series in December 2004 on the King/Drew Medical Center in Los Angeles led to a Pulitzer Prize and a more thorough coverage of the hospital’s troubled history. Lopez wrote a five-part series on the civic and humanitarian disgrace of Los Angeles’ Skid Row, which became the focus of a 2009 motion picture, The Soloist. It also won 62 awards at the SND awards. Since 1980, the Times has awarded annual book prizes. The categories are now biography, current interest, fiction, first fiction, history, mystery/thriller, poetry, science and technology, and young adult fiction. In addition, the Robert Kirsch Award is presented annually to a living author with a substantial connection to the American West whose contribution to American letters deserves special recognition”. The Times-Mirror Company was a founding owner of television station KTTV in Los Angeles, which opened in January 1949. It became that station’s sole owner in 1951, after re-acquiring the minority shares it had sold to CBS in 1948. Times-Mirror also purchased a former motion picture studio, Nassour Studios, in Hollywood in 1950, which was then used to consolidate KTTV’s operations. Later to be known as Metromedia Square, the studio was sold along with KTTV to Metromedia in 1963. After a seven-year hiatus from the medium, the firm reactivated Times-Mirror Broadcasting Company with its 1970 purchase of the Dallas Times Herald and its radio and television stations, KRLD-AM–FM-TV in Dallas. The Federal Communications Commission granted an exemption of its cross-ownership policy and allowed Times-Mirror to retain the newspaper and the television outlet, which was renamed KDFW-TV. Times-Mirror Broadcasting later acquired KTBC-TV in Austin, Texas in 1973; and in 1980 purchased a group of stations owned by Newhouse Newspapers: WAPI-TV (now WVTM-TV) in Birmingham, Alabama; KTVI in St. Louis; WSYR-TV (now WSTM-TV) in Syracuse, New York and its satellite station WSYE-TV (now WETM-TV) in Elmira, New York; and WTPA-TV (now WHTM-TV) in Harrisburg, Pennsylvania. The company also entered the field of cable television, servicing the Phoenix and San Diego areas, amongst others. They were originally titled Times-Mirror Cable, and were later renamed to Dimension Cable Television. Similarly, they also attempted to enter the pay-TV market, with the Spotlight movie network; it wasn’t successful and was quickly shut down. The cable systems were sold in the mid-1990s to Cox Communications. 2 Purchased along with KRLD-AM–FM as part of Times-Mirror’s acquisition of the Dallas Times Herald. Times-Mirror sold the radio stations to comply with FCC cross-ownership restrictions. ^ “The 10 Most Popular Daily Newspapers In The United States”. Retrieved October 24, 2017. ^ a b c Arango, Tim (2018-06-18). “Norman Pearlstine Named Editor of The Los Angeles Times”. The New York Times. Retrieved 2018-06-18. ^ “Mirror Acorn, ‘Times’ Oak,” Los Angeles Times, October 23, 1923, page II-1 Access to this link requires the use of a library card. Starr, Kevin (1985). Inventing the Dream: California Through the Progressive Era. New York: Oxford University Press. p. 228. ISBN 0-19-503489-9. OCLC 11089240. ^ Arango, Tim; Nagourney, Adam (2018-01-30). “A Paper Tears Apart in a City That Never Quite Came Together”. The New York Times. ISSN 0362-4331. Retrieved 2019-04-03. McDougal, Dennis (2002). Privileged Son: Otis Chandler and the Rise and Fall of the L.A. Times Dynasty. Cambridge, Mass. : Da Capo. ISBN 0-306-81161-8. OCLC 49594139. ^ Hiltzik, Michael (August 6, 2013). “Washington Post Buy: Can Jeff Bezos Fix Newspapers’ Business Model?”. Los Angeles Times. Retrieved October 6, 2014. ^ Chang, Andrea (April 17, 2018). “L.A. Times will move to 2300 E. Imperial Highway in El Segundo”. Los Angeles Times. Retrieved July 19, 2018. ^ “Biotech billionaire takes control of the LA Times, names new executive editor”. Orange County Register. Associated Press. June 18, 2018. Retrieved July 19, 2018. ^ Curwen, Thomas (20 July 2018). “For a brief, shining moment, Times Mirror Square was L.A.’s Camelot”. Los Angeles Times. Retrieved 21 July 2018. ^ Miranda, Carolina (17 July 2018). “Ugly carpets and green marble: The design of the Los Angeles Times buildings changed along with the city, though not always gracefully”. Los Angeles Times. Retrieved 21 July 2018. ^ “Tribune called on to sell L.A. Times”. CNN. September 18, 2006. Retrieved June 19, 2012. ^ “Tribune goes to Zell”. Chicago Sun-Times. April 3, 2007. Archived from the original on September 18, 2008. ^ James Rainey & Michael A. Hiltzik (December 9, 2008). “Owner of L.A. Times files for bankruptcy”. Los Angeles Times. ^ Koren, Meg James, James Rufus. “Billionaire Patrick Soon-Shiong reaches deal to buy L.A. Times and San Diego Union-Tribune”. latimes.com. Retrieved 2018-02-08. ^ “Tronc in Talks to Sell Flagship Los Angeles Times to Billionaire Investor”. February 6, 2018. Retrieved February 6, 2018. ^ “Tronc Pushes Into Digital Future After Los Angeles Times Sale”. February 7, 2018. Retrieved February 7, 2018. ^ James, Meg; Chang, Andrea (April 13, 2018). “Patrick Soon-Shiong plans to move Los Angeles Times to new campus in El Segundo”. Los Angeles Times. Retrieved 13 April 2018. Pappu, Sridhar (March–April 2007). “Reckless Disregard: Dean Baquet on the gutting of the Los Angeles Times”. Mother Jones. Hiltzik, Michael A. (July 3, 2008). “Los Angeles Times to cut 250 jobs, including 150 from news staff: The newspaper cites falling ad revenue in economic slowdown”. Los Angeles Times. Politi, Daniel (July 3, 2008). “Today’s Papers: “You Have Been Liberated““. Slate.com. ^ TJ Sullivan (January 13, 2009). “Los Angeles Times Ups Newsstand Price”. Nbclosangeles.com. Retrieved August 8, 2016. ^ Roderick, Kevin (January 30, 2009). “Los Angeles Times kills local news section”. LA Observed. Retrieved August 8, 2016. ^ Ravi Somaiya (September 20, 2015). “A Firing at The Los Angeles Times Focuses Discontent”. The New York Times. Retrieved September 21, 2015. ^ Somaiya, Ravi (September 8, 2015). “Austin Beutner Ousted as Los Angeles Times Publisher”. New York Times. ^ Mullin, Benjamin (October 5, 2015). “Tribune Publishing CEO announces buyouts”. Poynter. Archived from the original on December 8, 2015. Retrieved August 8, 2016. ^ “For the ‘funemployed,’ unemployment is welcome”. LA Times. June 4, 2009. Retrieved August 8, 2016. E&P Staff (May 28, 2007). “Pulitzer Winner Explains Why She Took ‘L.A. Times’ Buyout”. Editor & Publisher. Nielsen Business Media, Inc. Retrieved May 28, 2007. Cleeland, Nancy (May 28, 2007). “Why I’m Leaving The L.A. Times“. Huffington Post. ^ James, Meg (August 21, 2017). “Ross Levinsohn is named the new publisher and CEO of the L.A. Times as top editors are ousted”. Retrieved August 21, 2017. ^ Ember, Sydney (2018). “Union Is Formed at Los Angeles Times and Publisher Put on Leave”. The New York Times. ISSN 0362-4331. Retrieved 2018-01-20. ^ Bill Cromwell (April 26, 2010). “Like Newspaper Revenue, the Decline in Circ Shows Signs of Slowing”. editorandpublisher.com. Archived from the original on October 25, 2010. Retrieved April 26, 2010. ^ “The Los Angeles Times’ history”. Los Angeles Times. ISSN 0458-3035. Retrieved May 15, 2017. ^ As told to RJ Smith. “Ripped from the headlines – Los Angeles Magazine”. Lamag.com. Retrieved January 12, 2009. ^ Shaw, David. “Crossing the Line”. Los Angeles Times. Retrieved October 3, 2016. ^ Shah, Diane, “The New Los Angeles Times” Columbia Journalism Review 2002, 3. ^ Rainey, James, “Newspaper Circulation Continues to Fall,” Los Angeles Times May 1, 2007: D1. E&P Staff (May 25, 2007). “California Split: 57 More Job Cuts at ‘L.A. Times‘“. Editor & Publisher. Nielsen Business Media, Inc. Retrieved May 28, 2007. Lieberman, David (May 9, 2006). “Newspaper sales dip, but websites gain”. USATODAY.com. Saar, Mayrav (January 26, 2007). “LAT’s Scathing Internal Memo. Read It Here”. FishbowlLA. mediabistro.com. Archived from the original on October 30, 2007. Roderick, Kevin (January 24, 2007). “Times retools on web — again”. LA Observed. Welch, Matt (January 24, 2007). “Spring Street Project unveiled!”. latimes.com. “Metromix Makes Cool Debut”. latimes.com. July 10, 2007. Retrieved October 3, 2013. Ives, Nate (February 13, 2008). “Los Angeles Times Launches Free Weekly”. Advertising Age. Retrieved October 3, 2013. “Editor announces weekly tabloid aimed at social-networking readers”. latimes.com. March 25, 2009. Retrieved October 3, 2013. Roderick, Kevin (June 29, 2011). “L.A. Times folds Brand X”. LA Observed. Retrieved October 3, 2013. ^ Petroff, Alanna. “LA Times takes down website in Europe as privacy rules bite”. CNN. ^ Newcomb, Alyssa (25 May 2018). “Chicago Tribune, Los Angeles Times block European users due to GDPR”. CBS News. NBC Universal. Retrieved 8 June 2018. Elder, Sean (November 5, 1999). “Meltdown at the L.A. Times”. Salon.com. Retrieved March 26, 2007. Stewart, Jill (October 14, 2003). “How the Los Angeles Times Really Decided to Publish its Accounts of Women Who Said They Were Groped”. jillstewart.net. Archived from the original on February 1, 2008. Cohn, Gary; Hall, Carla; Welkos, Robert W. (October 2, 2003). “Women Say Schwarzenegger Groped, Humiliated Them”. The Los Angeles Times. Archived from the original on October 2, 2003. ^ “ASNE recognizes Los Angeles Times editor for leadership”. ASNE.org. American Society of Newspaper Editors. March 24, 2004. Archived from the original on November 15, 2007. ^ “LA Times Fires Longtime Progressive Columnist Robert Scheer”. Democracy Now!. Retrieved 2018-10-15. Astor, Dave (January 5, 2005). “‘L.A. Times’ Drops Daily ‘Garfield’ as the Comic Is Blasted and Praised”. Editor & Publisher. Nielsen Business Media, Inc. Archived from the original on January 7, 2005. Retrieved March 26, 2007. Muravchik, Joshua (November 19, 2006). “Bomb Iran”. Los Angeles Times. Retrieved March 26, 2007. Rainey, James (March 22, 2007). “Editor Resigns over Killed Opinion Section”. Los Angeles Times. Archived from the original on March 25, 2007. Retrieved March 26, 2007. Martinez, Andrés (March 22, 2007). “Grazergate, an Epilogue”. Los Angeles Times. Retrieved March 26, 2007. ^ Carroll, Rory (2017-11-07). “Disney’s blackout of LA Times triggers boycott from media outlets”. The Guardian. ISSN 0261-3077. Retrieved 2017-11-07. ^ “Why I won’t be reviewing ‘The Last Jedi,’ or any other Disney movie, in advance”. Washington Post. Retrieved 2017-11-07. ^ Carroll, Rory (2017-11-07). “Disney ends blackout of LA Times after boycott from media outlets”. The Guardian. ISSN 0261-3077. Retrieved 2017-11-07. ^ “Los Angeles Times – Media Center”. Los Angeles Times. January 17, 1994. Retrieved January 12, 2009. ^ “The 1984 Pulitzer Prize Winner in Public Service”. The Pulitzer Prizes. Retrieved 2018-07-22. ^ “1999 Pulitzer Prize winners for beat reporting”. Columbia journalism review. Retrieved May 29, 2012. ^ Shaw, David (April 13, 1999). “2 Times Staffers Share Pulitzer for Beat Reporting”. Los Angeles Times. Retrieved July 30, 2012. ^ “The Pulitzer Prizes | Biography”. Pulitzer.org. October 18, 1956. Retrieved August 16, 2010. ^ “2009 Pulitzer Prizes: Journalism”. Reuters. April 20, 2009. Retrieved October 6, 2014. ^ “The Pulitzer Prizes | Citation”. www.pulitzer.org. Retrieved November 13, 2015. ^ “Los Angeles Times”. Los Angeles Times. April 18, 2016. Retrieved April 18, 2016. ^ “Los Angeles Times”. Los Angeles Times. April 15, 2019. Retrieved April 17, 2016. ^ “December 1903: Hearst’s Examiner comes to L.A”. Ulwaf.com. Retrieved October 21, 2012. ^ “Harrison Gray Otis Southern California Historical Society”. Socalhistory.org. May 25, 2016. Archived from the original on October 2, 2015. Retrieved August 8, 2016. ^ “Our Annual Trade Number,” Los Angeles Times, December 18, 1886, page 4 Access to this link requires the use of a library card. ^ “Our Annual Edition,” Los Angeles Times, December 21, 1888, page 4 Access to this link requires the use of a library card. ^ “General Contents,” Los Angeles Times, January 1, 1895 Access to this link requires the use of a library card. ^ Quoted in “Highest Praise Given to ‘Times,'” Los Angeles Times, January 28, 1923, page II-12 Access to this link requires the use of a library card. ^ “Bigger and Better Than Ever,” page F-10 Access to this link requires the use of a library card. ^ “‘The Land and Its Fruits’ — Our Harvest Number,” Los Angeles Times, September 5, 1891, page 6 Access to this link requires the use of a library card. ^ “Ready Tomorrow,” Los Angeles Times, September 4, 1891, page 4 Access to this link requires the use of a library card. ^ “The Wireless Daily Achieved” by C. E. Howell, The Independent, October 15, 1903, pages 2436-2440. ^ “Los Angeles Times website”. latimes.com. April 17, 2014. Retrieved October 6, 2014. ^ “Los Angeles Times Community Newspapers Add New Title, Increase Coverage and Circulation with Sunday News-Press & Leader”. Los Angeles Times. January 12, 2011. Los Angeles Times Community Newspapers (TCN) include the Glendale News-Press, Burbank Leader, La Cañada Valley Sun, Huntington Beach Independent, Daily Pilot (Costa Mesa, Newport and Irvine) and Laguna Beach Coastline Pilot. TCN newspapers maintain separate editorial and business staffs from that of The Times, and focus exclusively on in-depth local coverage of their respective communities. ^ “The Pasadena Sun Publishes Last Issue”. Editor & Publisher. July 1, 2013. ^ Heller, Steven. “Go West, Young Art Director,” Design Observer (Sept. 23, 2008). 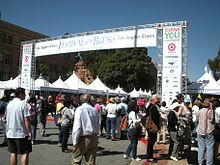 ^ “Los Angeles Times Festival of Books”. Retrieved October 6, 2014. ^ rebecca Buddingh (September 26, 2010). “L.A. Times fair comes to USC”. Daily Trojan. University of Southern California. Retrieved October 21, 2012. ^ “Los Angeles Times Book Prizes home page”. Retrieved October 6, 2014. ^ a b McDowell, Edwin (August 11, 1983). “Times Mirror is Selling New American Library”. The New York Times. Retrieved October 3, 2015. ^ “Mosby Company History”. Elsevier. Retrieved October 3, 2015. ^ Storch, Charles (June 27, 1986). “Times Mirror Selling Dallas Times Herald”. Chicago Tribune. Retrieved June 26, 2012. ^ “Johnson family sells Austin TV.”[permanent dead link] Broadcasting, September 4, 1972, pg. 6. ^ “Times Mirror’s deal for Newhouse’s TVs gets FCC approval.”[permanent dead link] Broadcasting, March 31, 1980, pg. 30. ^ “Changing hands: Proposed.”[permanent dead link] Broadcasting, September 30, 1985, pg. 109. ^ “Times Mirror set to sell four TV’.” Archived June 9, 2015, at WebCite Broadcasting and Cable, March 22, 1993, pg. 7. Prochnau, William (January–February 2000). “The State of The American Newspaper: Down and Out in L.A.” American Journalism Review. College Park: University of Maryland Foundation.